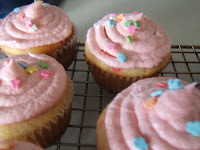 It's my neighbor's 9th birthday and I wanted to make her a special cupcake present, and what better than a yellow cupcake with pink buttercream!! 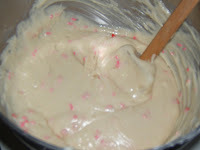 Not to mention that I added red and pink sprinkles to the cupcake batter. 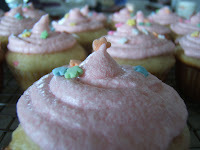 These little cakes came out soo cute...and don't tell Ashtyn, but I had to try one...only for safety reasons of course! I had to make sure that I was serving a quality cupcake to the birthday girl. 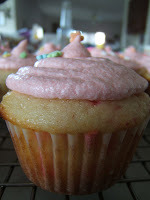 And I must say this cupcake was so delicious, it's one of the best cupcakes I've ever had. 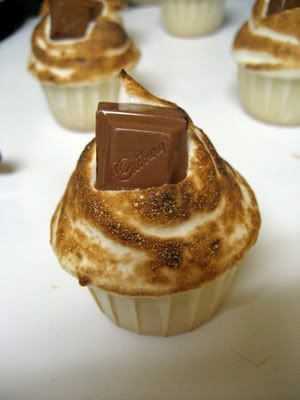 I know I'm a self proclaimed choco-holic, but I really like the lightness that this cupcake offered. And the cake was cooked perfectly, to the point where it's golden all around, but is still very moist on the inside, LOVE IT!! The only problem that I had, and this has happened a few times now is that my buttercream comes out looking a little separated, and I'm not sure how to fix that, so if anyone has any ideas I'd love to hear from you. Other than that I think this cupcake is going to be a hit. Very sweet! 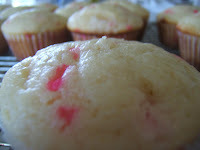 What yellow cupcake recipe did you use? I believe the separation is from over-beating the frosting. I actually can't remember what recipe I used, I'm trying to think back (which is embarassing because it was only a few days ago)...but I just can't put my finger on it :0( But thank you for the tip, you're probably right about the overbeating...so next time I'll try to hold back! My other question would be what kind of buttercrea recipe did you use?